Fill in your details below to watch immediately! Seek consistent profits regardless of market direction. Use hedged positions to protect from a market crash. Create, backtest and generate trade signals from your own custom long/short portfolio. Manage End-of-Day in under an hour/day. Why use PairTrade Finder™ PRO? The main benefit of pair trading is that your exposure to market and sector risk is significantly reduced, i.e. “hedged,” by holding both long and short positions in equal dollar amounts in a single or highly correlated set of market sectors. Pair Trading works (see research studies under Pair Trading Resources above) because the relationship between two COINTEGRATED stocks is much more predictable and reliable than the outright prediction of the direction of a particular stock. TOP US EQUITY PAIRS PRE-LOADED into PAIRTRADE FINDER™ PRO. Generate immediate TRADE SIGNALS. Chosen through rigorous backtesting of over 1,800 symbols and meeting strict cointegration, profitability and robustness measures. "Turbo boost" your trading results out-of-the-box. PRO's PROFESSIONAL-GRADE BACKTESTER analyses over 1 million securities on up to 10 years of data and identifies smooth equity curves. Review Cointegration, Correlation, CAGR%, Max DD%, Profit Factor, Win Rate etc. for every pair. Commissions and Slippage estimates and the use of Adjusted Close offer maximum accuracy. Approximate live trading conditions. PRO's 24/7 MARKET RADAR. Receive Real-Time or End-of-Day Entry and Exit signals from your custom pair trading system (with visual and audio alerts) and by email. Most importantly, optimise you pair trading system with our backtester on ten years’ worth of historical data to give you the confidence in your system’s profitability and robustness. PRO INTEGRATES WITH INTERACTIVE BROKERS FOR SEMI-AUTOTRADING directly into your IB Trader Workstation. Configure PRO signals to allow execution ON-THE-FLY with IBKR Mobile. LOWEST COST ONLINE BROKER, with widest range of single-stock CFDs! USE IB's HIGH QUALITY, REAL-TIME AND HISTORIC DATAFEEDS, covering over 120 markets and 26 countries at NO EXTRA COST! Including equities, ETF, options, futures, FX, and CFDs. PRO ALSO INTEGRATES WITH IQFEED (paid subscription) for real-time and historic data covering NYSE, NASDAQ, AMEX, LSE, TSX, stocks, options, futures and FX. FREE DELAYED STOCK DATA OUT-OF-THE-BOX! Built-in links to Yahoo! 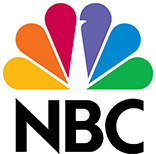 Finance free Historic and Delayed Stock Data, News, Corporate Actions and Fundamentals. Studies show that over 90% of traders don't take advantage of falling stock prices by short selling stock, which most brokers offer. Start short selling like the pros using PairTrade Finder™ PRO. Harness the power of PRO's technology to show you how and gain market edge. Investors and traders, big and small, can benefit from allocating at least a portion of their portfolio to pairs trading. 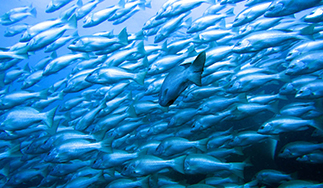 Including pairs trading in a portfolio diversifies risk and decreases overall market exposure. Popular pairs include: KKR vs. AB, BK vs. BX, EA vs. ZNGA, E vs. SSL and hundreds more! Start your 15 DAY FREE TRIAL of PairTrade Finder™ PRO (no payment required) and get our FREE eBook with 11 Pair Trading Lessons from the Pros. Enter your details below and watch immediately! Is it really free for 15 days? Yes! PairTrade Finder™ PRO is completely un-restricted to use for 15 days. PayPal account or credit card details are required to secure the free trial access but you will not be charged if you cancel within the first 15 days. Additionally, we offer a 30-Day Money Back Guarantee (less 10% administration fee) after you have made the initial payment. That’s a full 45 days to trial PairTrade Finder™ PRO. Downloading and installation takes less than 5 minutes. Start producing back-tested and custom-selected trading signals to give you a legitimate edge today! How difﬁcult is it to use? Is payment required for securities data? Integration with an Interactive Brokers’ (“IB”) trading account for real-time and historic data PLUS semi-auto trading on all products available through Trader Workstation. Available at NO EXTRA COST TO YOU over your existing IB data prices, some of the lowest in the industry. A subscription to a real-time, high-quality datafeed from IQFeed for equities, futures, forex and options, the market leader (free trial available). Yahoo! Finance FREE historic and delayed datafeed for equities on many worldwide markets (NB: subject to the availability and quality of the Yahoo Finance API). What markets and instruments can I trade? Depending on your datafeed, you can trade up to 120 markets in 26 countries around the world for equities, ETFs, indices, options, futures, CFDs and FX. How do I receive trading signals? PairTrade Finder™ PRO allows you to design, rigorously back-test and optimise your own pair trading strategy, then upload your optimised pairs into a Watchlist to automatically generate real-time trading signals. These signals can be delivered as audio signals, on-screen signals and by email to any account you choose. These can also be used to semi-autotrade with Interactive Brokers’ Trader Workstation. 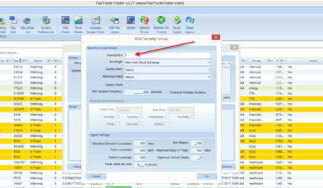 Who uses PairTrade Finder™ PRO? Professional traders, brokers, advisors, hedge funds and retail traders use PairTrade Finder™, which has been downloaded over 6,000 times. These thousands of people from over 30 countries use our platform to help out-perform the markets with less risk. What are the recommended system requirements to use PRO? PAIRTRADE FINDER™ PRO RECOMMENDED SYSTEM REQUIREMENTS: Operating system - Windows 7 or higher. RAM - 8GB, with 2GB available solely for Trader Workstation if integrating with Interactive Brokers. Processor - minimum Intel i5 or higher, minimum QUAD CORE. External video card with at least 2GB of memory. Screen resolution 1280x1024. Solid-state disk (SSD). Broadband internet connection - minimum 5 MB/sec. 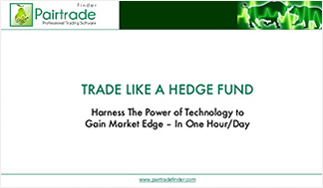 TRADE LIKE A HEDGE FUND- Harness the Power of Technology to Gain Market Edge in One Hour Per Day. 15 Trading Tips for Equity Pairs With PairTrade Finder™'s Stock Trading Software. Any performance results of our recommendations prepared by www.pairtradefinder.com or www.pairtradingsignals.com are not based on actual trading of securities but are instead based on a hypothetical trading account. Hypothetical performance results have many inherent limitations. Your actual results may vary. No representation is being made that any account will or is likely to achieve proﬁts or losses similar to those shown anywhere in our published materials. © Event Driven Investor Limited 2007-2019. All rights reserved.